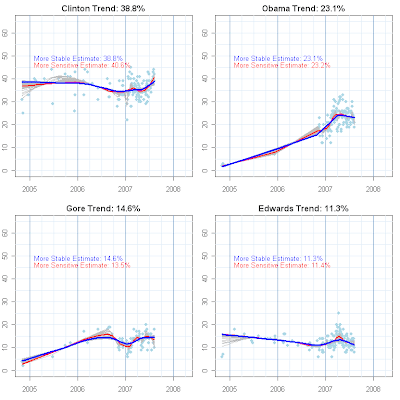 One great value of long term data archives for polling information is the ability to compare trends over long spans of time and across different question wording. The Roper Center at the University of Connecticut provides one of these archives. Its subscription only iPoll database includes over 500,000 questions that pollsters have asked since 1935. This is a uniquely valuable resource for opinion research. Public support for the death penalty over time is a good example of the power of this collection. 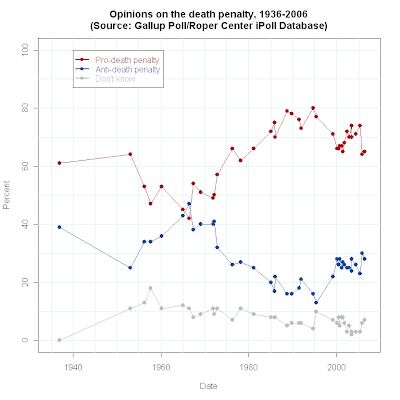 The plot above looks at death penalty support and opposition since 1936 in Gallup polls. Gallup has maintained a constant question wording over that span giving us the best long term look at this issue. Gallup has a summary of these data on a no-subscription required page here. It provides more data than I look at here. Support for the death penalty declined to a low in 1960-75, with support around 50% and opposition around 40% (with some bouncing around a bit.) Following 1975 there was a long growth in support for the death penalty, with support rising to as high as 80% and opposition falling into the teens. Since the decline in homicide rates in the 1990s, support has declined by about 10 percentage points since 2000, to around 70%, with opposition rising to the mid-20s. The public overwhelmingly supports "the death penalty for a person convicted of murder." But now let's consider what happens when we offer a specific alternative to the death penalty. 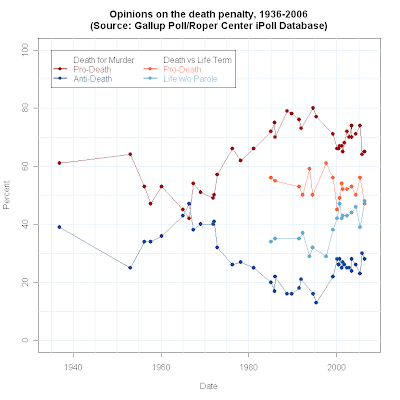 In the classic Gallup question, there is no explicit alternative to the death penalty, so respondents must imagine for themselves what the alternative might be. If you could choose between the following two approaches, which do you think is the better penalty for murder--the death penalty or life imprisonment, with absolutely no possibility of parole? This reflects a shift in the policy debate, as no-parole sentences were raised as an alternative to execution. With the "life without parole" option, support for execution falls to just over 50%, while support for life terms rises to the mid 40s. Still a majority in favor of the death penalty, but a substantially more closely divided public than with the classic question. Two points from this. First, questions define the alternatives respondents are encouraged to consider. The classic question offers one option and leaves it to the respondent to imagine others. The death vs life introduces an explicit alternative, and finds much more support for a penalty short of death. However, we could imagine a question with a third option: life but with a possible parole. Or even specific sentence lengths (10 years? 20? 50?). In part the question reflects the policy debate. But survey questions must also necessarily limit the range of options under consideration. In this, there can be no escape from question wording effects, and no end to argument about whether questions "really" capture all the issues. The fact is every question includes some and excludes other options. The second point is the political one. If one opposed the death penalty, one might be more likely to find support by arguing forcefully for hard time and no parole rather than arguing against the death penalty in principle. The appearance this week of Monica Goodling before the House Judiciary committee sparked a conversation in the Political Arithmetik household about a previous Monica related Washington scandal. It perhaps says something about our household that this provoked a search for empirical evidence concerning the effect of the Clinton-Lewinsky scandal on the popularity of Monica as a name. Was it urban legend that the scandal had an effect? Was the effect large or small? Was it immediate? Let's run the numbers. If we were going to pick a name to go with a DC scandal from babies born in 1973, better bets would have been Jennifer, Amy, Michelle, Kimberly, Lisa, Melissa, Angela, Heather, Stephanie or Rebecca, the top 10 girls names that year. But Monica at 40th wasn't rare by any means. The 1970s were the peak years for Monicas. By the 1990s the name had slowly but steadily declined to rank between 76th and 88th during 1990-1997. And then the events of 1998 intervened. The Clinton-Lewinsky scandal broke on January 21, 1998, reached its fevered peak by the end of 1998 with the impeachment of President Clinton and was resolved by the Senate's failure to convict on February 12, 1999. Of course that didn't prevent late night comics from continuing to milk the material for months, years, perhaps forever after. The impact on parents was immediate, but not as drastic as I had expected. There were 11 months of 1998 in which the scandal's impact could be felt. 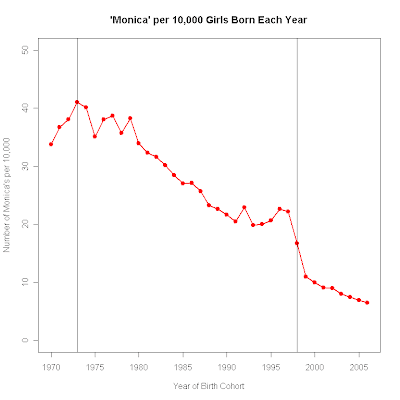 And the ranking of Monica dropped from 79 in 1997 to 105 in 1998, a substantial but not precipitous drop. Of course events were unfolding during this year, so perhaps it is reasonable to focus on 1999, by which time surely every expectant parent in America would be aware of the Clinton scandal. 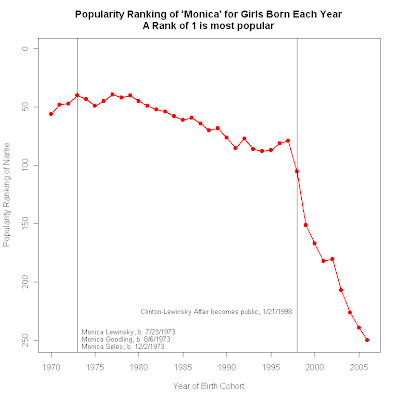 And in 1999 the ranking of Monica did fall dramatically, to 151, just a bit below where it stood in 1960. So indeed, the impact of the scandal produced an immediate and substantial response, as one would surely expect. No urban legend this. But what I find fascinating is the continued decline since 1999. I would expect the impact to be greatest in the immediate aftermath of the infamous episode and to level off or perhaps even abate thereafter. 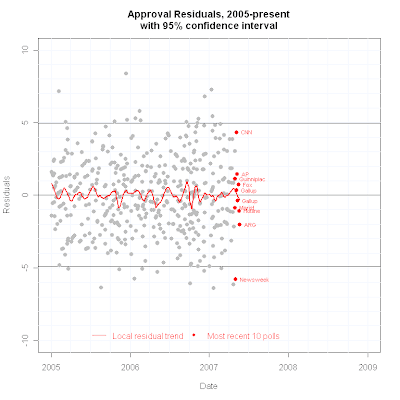 Instead, the data suggest a much slower response and a much longer diffusion of unpopularity through the population. 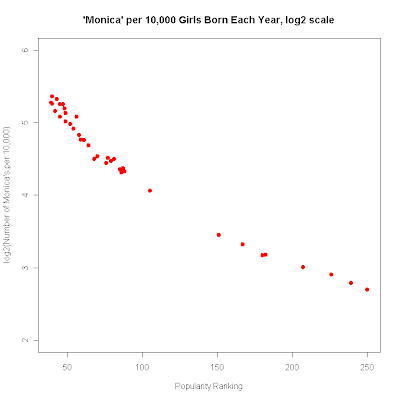 Having dropped 72 places between 1997 and 1999, the popularity of Monica dropped ANOTHER 99 places from 1999 through 2006, the last year for which we have data, to now stand at the 250th name on the popularity list. One interesting speculation is to consider the effect of the Clinton-Lewinsky scandal on the parents who are just now having baby girls. Many of them would have been in their teens or early 20s during the height of the scandal, compared to parents of 1999 or 2000 who would have been on average 7 or 8 years older. I wonder if the impact of the scandal was larger on teenage and college age parents to be. These are ages not noted for consumption of political news, but they are ages extremely well known for crude sexual humor, for which Kenneth Starr provided an abundant supply of raw material. So I wonder if this cohort that is now giving birth was somewhat more affected by the scandal than were even slightly older cohorts who were past the age of campus humor as well as early sexual development. That could explain the continued and steady decline in use of Monica as a girl's name. It would also predict a leveling off once cohorts start to dominate births who were too young to understand the Clinton-Lewinsky scandal at the time. The alternative is a slow diffusion of unpopularity throughout the culture, which is having an increasing effect regardless of personal experience with the scandal. If so, there is little reason to expect a leveling off of ranking. But there is also a puzzle about why the cultural diffusion is as slow as it has been. It seems unlikely that Monica Goodling's testimony will significantly reduce the already declining popularity of the name. But given the current standing of "Monica", it is much less likely that a DC scandal in 2035 or so will feature a Monica in the staring role. Prospective parents may want to visit the source of these data, the Social Security Administration's Popular Baby Names site here. A superb academic study of the sociology of naming babies is A Matter of Taste: How Names, Fashion and Culture Change, by Stanley Lieberson. Warning: This is the really geeky part. Unless you think log2(x) is really cool, you might want to turn back now! Hmmm. 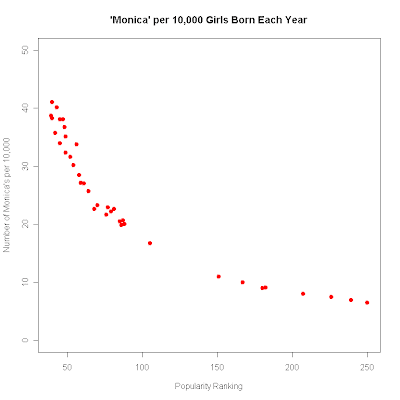 Try graphing the percent of babies given the name Monica in each year instead of the popularity rank. I think your discussion might change. The good Professor M makes an excellent point. Let's think why. The actual rate of name use is quite small, even for the most popular names. For example, in 2006 the most popular name for girls was Emily. That name was used for 1.0267% of girls born. The number 2 name was Emma, 0.9159%. This difference in percentages is actually rather large. When we get down to ranks 101 and 102 we find Mya at 0.1602% and Amanda at 0.1599%. When we get down to Monica at 250, the rate is 0.0650% and for Carly at 251 the rate is 0.0649%. So the rate of name use gets closer together for adjacent ranks as we go from more popular to less popular ranks. In my plots above, a change of one rank is the same vertical distance in the plot whether we are going from 1 to 2 or 100 to 101 or 250 to 251. But the percentage rates would not be changing by the same amount for each of those ranks. Instead, the difference in percentage rate would be getting smaller as we go from more popular to less popular rankings. In techie terms, the relationship between rank and percentage use is non-linear. And that can produce a different look to the plot, as Professor M suggests. So let's take a look. And behold! As Professor M suggested, the look is a bit different. 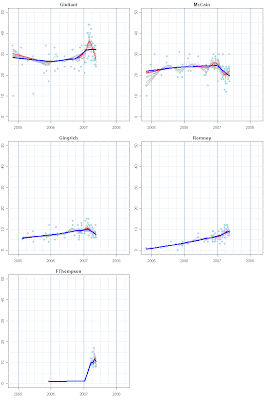 What appears as a continued sharp drop after 1999 in my plot of rankings, now looks more like a continued decline but not so sharp, and much more of the decline came between 1997 and 1999. Also, the declining popularity of Monica between 1973 and 1997 appears more substantial, dropping from 41 per 10000 to 22 per 10000. So Professor M's point is well taken. The change in rates are significantly different from the change in ranks. The popularity of Monica has continued to decline since 1999 but not nearly so dramatically as it appears in my ranking graph. Is the raw percentage (or per 10,000) rate the right measure either? As the rate approaches zero, it becomes impossible to decrease by a constant amount. 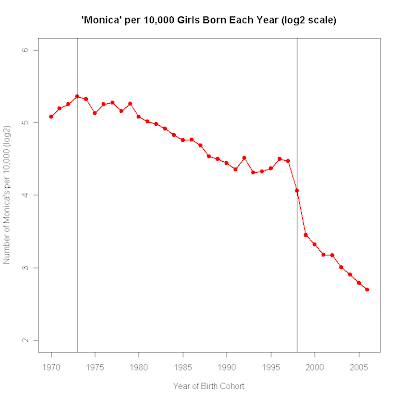 From1973 to 1997, the rate of use of Monica fell from 41.0 to 22.1 per 10,000, a decline of 18.9. But in 1999 the rate was 10.96 per 10,000. It would be impossible for that to decline by another 18.9, lest we end up with a negative rate of name use! The point is, a constant change in the raw rate is impossible as we approach low incidence of the name. So perhaps linear change in the rate is also not a good way to model this. An alternative is to think of the "half life" of the name use. This equates a fall of 1/2 from say 40 to 20 per 10000 with an equivalent proportionate change from 10 to 5 per 10000. This makes proportionate declines equal across the entire range of name rates. In effect, this says a fall of 1/2 in usage rate is the same wherever it occurs. A simple way to measure this is to use the log base 2 of the rate per 10000. In base 2, each unit increase on the log2 scale is a doubling of the rate. So 1=log2(2), 2=log2(4), 3=log2(8), 4=log2(16), 5=log2(32) and 6=log2(64). Those values cover the range of Monica rates, and the critical point is that each 1 unit increase is a doubling and each 1 unit decrease is a halving of the rate of use. Now we see that from 1973 to 1997 the log2 rate fell from 5.4 to 4.5, or almost a full unit, representing a halving of the rate. From 1997 to 1999 it fell from 4.5 to 3.5, another halving. And from 1999 to 2006 from 3.5 to 2.7, a bit less than half again. On this scale of proportionate change then, the drop from 1997 to 1999 is huge, a full halving of the rate (from 22.1 per 10,000 to 10.96) in just 2 years. The subsequent decline from 10.96 to 6.50 is a 41% decrease in rate over 7 years. Now this plot is not identical to my ranking plot, but it is pretty close. The qualitative description in my original post applies pretty well to this one as it did to the ranking plot. So I stand by my original comments. I had not looked at these issues before Professor M's comment, so I am very grateful to him/her for pointing this out. And indeed, as we saw above, the raw rates do look somewhat different. But on reflection, prompted by that comment, I think the log2 rate is probably the most reasonable way to look at this. The ranks alone can be misleading because the equal intervals between ranks distort the changes in rate. But the raw rates are also misleading because changes cannot remain constant when there is a lower limit of zero usage which we approach. Proportionate change seems more compelling in this case, and log2 is a convenient and easy to understand approach to this. And one last technical point. The plot of rate against rank is strongly non-linear, as Professor M implies. The plot of log2(rate) against rank is much closer to linear, though with some continued bend. 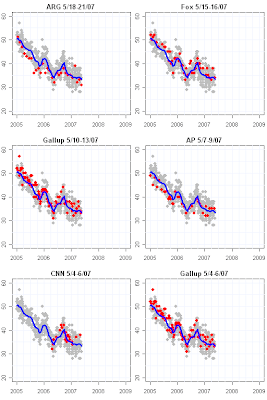 This is why my final log2 plot above more closely resembles the rank plot. Since log2 rate is close to linear with rank, the two plots must look quite similar. The new CBS News/New York Times poll, taken 5/18-23/07, finds approval of President Bush at 30%, disapproval at 63%. The April 20-24 CBS poll had approval at 30%. With the addition of the new poll my approval trend falls to 32.2%. The blue trend line has taken a sharp dip over the past 6 or so polls and now stands right at the lower edge of the uncertainty around the trend of the past five months. Since January we've seen a couple of periods in which the trend dipped below 33%, only to quickly revert back up to the 33-35% range. Inspecting the figures below casts a bit more light on the current polling. First, the more sensitive "Ready Red" estimator pegs approval at 31.2%, still about a point below "Old Blue's" take. Still not much divergence between the two estimators. 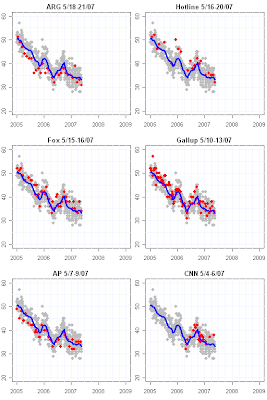 Of the last six polls, three usually fall a little above the trend estimate (Hotline, Fox and Gallup) while three usually fall below (CBS, ARG and AP). So the current reading isn't entirely due to a string of polls all of which usually have negative "house effects". Likewise, the residuals are pretty well behaved right now. 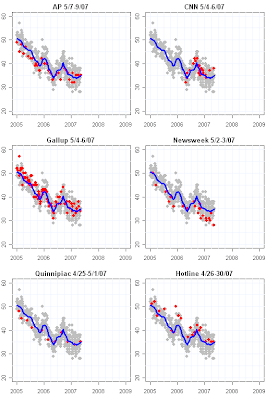 While the Newsweek outlier sets the recent low, it is largely offset by the high (but not outlier) CNN result. 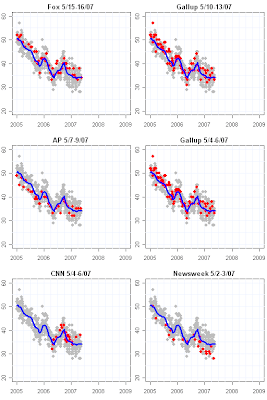 The remaining 8 recent polls are rather close to the trend estimate. Finally, the range of uncertainty around the trend line, reflecting how much the trend can jump around as different polls come or go, is rather wide for the current estimate, suggesting a range of uncertainty that includes 30% but also 35%. That will shrink as new polls come in. The bottom line: The model is not yet unambiguously insisting on a new downturn in approval. And it would be well to remember that we've seen this kind of a dip more than once this spring, only to quickly see a return to the recent equilibrium. So before declaring that decline is a certainty, we should remember that such a prediction has been wrong recently. There has been some analysis that the immigration bill will turn Republicans against Bush, resulting in inevitable decline as his one remaining support group fails him. I think that is certainly possible, but must point out that it is exactly what did NOT happen last May. Then Bush had been in steady and strong decline since February. That trend hit a low estimate of 33.98% on May 12. On May 15 the president gave a televised address to the nation in support of immigration reform. His approval rating immediately turned up and was followed by a quite good summer (compared to his previous lows.) One can argue that the immigration issue has changed within the Republican party since that time and is now poison. Or one can argue that Bush has shown little recent leadership on immigration, and so will get no benefit from the issue. But I think immigration is a good deal more complicated than the confident assumption that the issue must be poison to the president's approval rating. I'd also point out that opinion on Iraq remains strongly against the president even as he and his administration have stressed the negative implications of deadlines and benchmarks for Iraq funding. Often presidents have been effective in arguing that Congress cannot be commander in chief, or that any funding constraints must undermine the troops. Clearly the White House has expected those messages to ultimately move the public in their direction. So far there is little evidence of that. So it may just be the fundamentals that are driving approval at this point. And the single most fundamental right now is Iraq. By most measures, the public has remained unsympathetic to Bush's recent arguments. 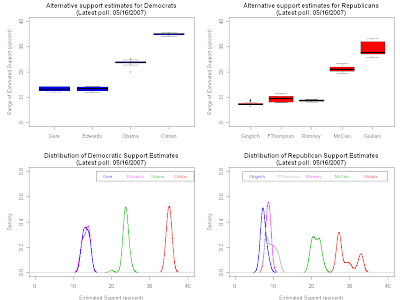 This post compares the estimates of presidential national primary support using the "stable and a bit stodgy" "Old Blue" estimator to the "sensitive and a bit gullible" "Ready Red" estimator. For a full description of these see this post. Briefly, the Blue estimator is slow to react to just a few polls which suggest a change in trend but which may in fact just be random noise. The Red estimator is more sensitive to new polls and is therefore quicker to pick up change but also more likely to mistake random noise for new trend. When the two overlap, only the blue estimate is visible in the plots. In the long run, the two agree quite well. Put more trust in Blue if you prefer not to make mistakes. Red will alert you to changes quickly, but will also "cry wolf" more often. This page is updated in place, so come back here for future updates. A link to this page appears in the right column's thumbnails. A new Diageo/Hotline poll collected 5/16-20/07 of 800 registered voters finds approval at 32%, disapproval at 64%. The Hotline poll usually runs a little above the trend estimate, but in this case is a point under trend, which now stands at 33.0%. Over the last several polls, approval has moved down a bit. It remains in the 33-35% range we've seen since January, but only just barely. Since we've been talking about "Ready Red", the sensitive trend estimator in comparison to "Old Blue", the more conservative estimator I use here, I've also run a graph comparing the two. Red is willing to go a point lower in approval than Blue. 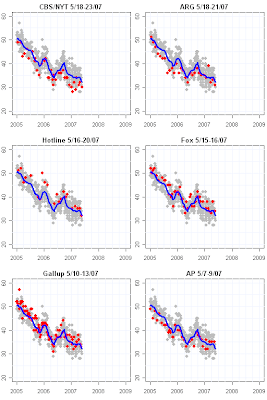 But notice how well the two trends usually agree once all the data are in. If you can't see the red line below, that's because Blue is on top of it-- i.e. they agree. And usually they agree because Red eventually sees that Blue was right. HOWEVER, when approval or other trends DO change direction suddenly, it is Red that eventually convinces Blue to move along. At the moment, the difference is quite small and I'd say there is little additional evidence from Red at this point. I've been impressed by the stability of approval for the past five months. I still am. I'll need to see four or five more polls all clearly below trend before I'm convinced that the current dip is real, and not just another false lead from a few polls. The diagnostics below show no alarming indicators of anything, so nothing more to say. I usually focus on the full set of polls available for an analysis. But sometimes it pays to zoom in on only some recent trends. 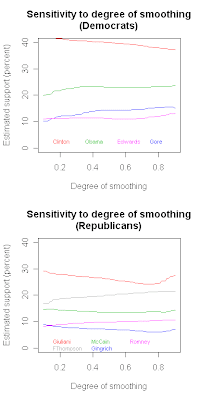 In the case of the Republican presidential nomination battle, zooming in clarifies things a bit. While I usually prefer the more conservative estimator because it is harder to fool it with a few polls, in this case it is clear that the Giuliani trend has taken a downturn since March. 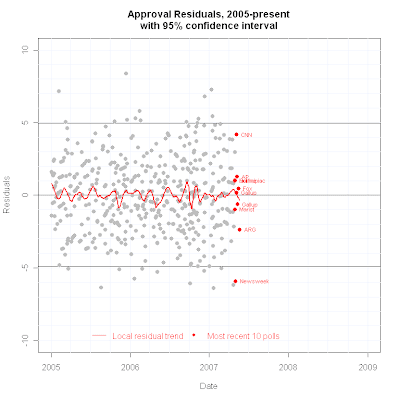 The evidence for a McCain upturn is much less compelling, but the red estimator thinks it sees a little bit of one. In the plot above, it is clear that the sensitive red estimator follows the data rather well since early November when presidential nomination polls became frequent. 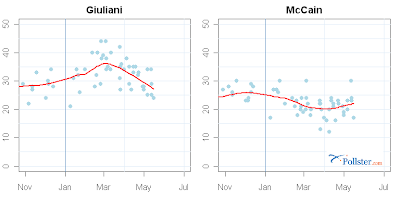 The Giuliani trend clearly illustrates his substantial run-up but also his subsequent decline. The trend estimator now stands a point below where Giuliani began in November. McCain, on the other hand, was in decline from December until about April 1. Since then he appears to have gained a couple of points. This means that a substantial gap that Giuliani opened on McCain in the first quarter of the year has now largely disappeared. Giuliani has been ahead of McCain in the vast majority of polls, including 54 of the 56 polls taken since November 1 (see here as well). But that gap is narrowing. A new American Research Group (ARG) poll taken 5/18-21/07 has approval of President Bush at 31% and disapproval at 64%. With this addition, the approval trend estimate is at 33.4%. The recent downward wobble is still unconvincing as an indication of a shift in trend. We've seen exactly this kind of wobble for nearly five months now, with down wobbled converted to up wobbles and back down. So for the moment, pending a good deal more data, I continue to believe that approval remains in the 33-35% range we've seen since January. 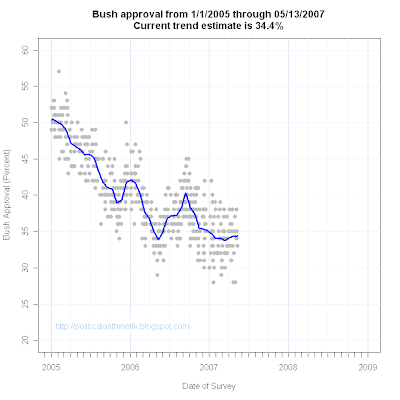 This is now the longest period of stable approval we've seen in the entire Bush presidency. Evidently the Republican President and Democratic Congress are stuck in an equilibrium with each other-- unable to convince voters to shift their views of the president one way or the other. Events may eventually disrupt that equilibrium, but so far the Iraq debate and Department of Justice hearings have failed to do so, as has the White House critique of Democratic "surrender dates" and defense of Attorney General Gonzalez. No time to write about this just now. 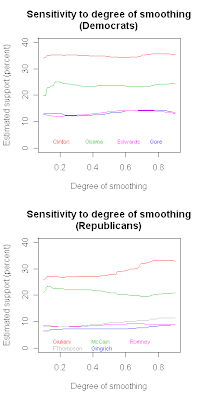 The red "sensitive" trend estimator mostly agrees with conservative and stable "old blue". But the Clinton blue line now shows a very slight downturn, reflecting the earlier decline (and current stability) of the red line. Obama continues to look nearly flat. On the Republican side, Giuliani's recent slide remains very apparent, while McCain's recent modest upturn also continues. Note how bimodal Giuliani's estimates have become in the second graph below, emphasizing the difference between short and long term estimates. This makes it more and more likely we'll see a downturn of the blue line for Giuliani. 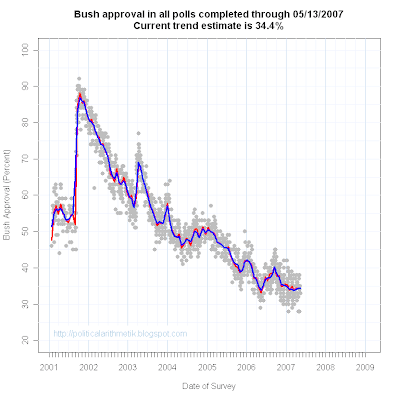 The Fox poll (taken 5/15-16/07) finds approval of President Bush at 34% and disapproval at 56%. That is down from 38% in the previous Fox poll, but in line with three Fox readings in February and March, so offers little evidence for any significant change in approval. The trend estimate stands at 34.2%, also consistent with the stable approval level of 33%-35% we've seen for some time. The usual diagnostics are below. No big news there. I'm becoming convinced that my hasty, sensitive and mistake prone trend estimator, "Ready Red", has got the story right this time. For some time I've been watching the Giuliani and McCain trends. Since December, McCain has steadily trended down at a nearly constant rate. Giuliani has trended up over that time, but the trend estimator has been flattening out over the last couple of months, though still rising. 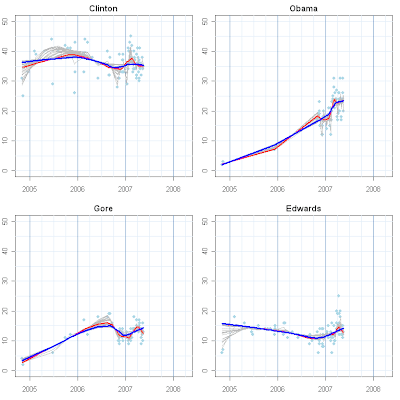 That is based on "Old Blue", the conservative estimated trend line in the figure above. Blue is designed to be relatively slow to change direction but hard to fool with a handful of polls that represent more noise than new trend. But in this case, it is looking more and more like the trigger happy Red estimator has in fact picked up the current trend. Charlie Cook at the Cook Political Report has graciously passed along the results of the latest Cook/RT Strategies poll, completed 5/11-13/07. This poll finds Giuliani at 25% and McCain at 24%. Two weeks earlier, 4/27-29/07, the Cook/RT Strategies poll found Giuliani at 28% and McCain at 21%. Given the sample sizes, which are typical of current national polling, this shift falls short of statistical significance. Nonetheless, this is in line with other recent polling trends and the sensitive Red estimator picks up this trend. Giuliani spent a long time as the surprise front runner in the Republican nomination polls, leading McCain in the vast majority of polls. (I wrote about this in March: "Giuliani Leads, Press Finally Notices" and earlier in December: "The Republican Primary Race".) This was a mystery given Giuliani's liberal positions on abortion, gun control and gay rights. For people who follow politics closely, it was hard to believe that Republican constituents could set aside these positions which have been anathema to the "base" for nearly three decades. And yet he continued to lead and McCain fell steadily. McCain's decline was somewhat less mysterious. His sponsorship of the McCain-Feingold campaign finance legislation, his opposition to the administration on torture, and his support for immigration reform have put him at odds with many on the right in the party. But things have been changing recently. Giuliani appears to have benefited from a great many Republicans who simply did not know where he stood on these bedrock issues of conservative Republican principles. In the last two or three months that has begun to change as Giuliani has become the focus of news coverage that has emphasized his positions. Giuliani's recent clarification of his positions, and his performance in tonight's second Republican debate, is likely to further increase awareness among Republican voters. 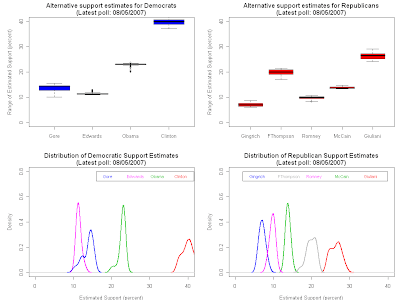 While polling has found, somewhat surprisingly, that many Republicans say they are willing to overlook these issues I think there has been an inevitable drag on Giuliani, and that is now showing up in the Red estimator. At the same time, McCain has tried to restart his campaign and it appears to have at least stopped his falling support and perhaps begun to produce some gains. I am very slow to accept the responsive Red estimator because it is easy to be fooled by it. 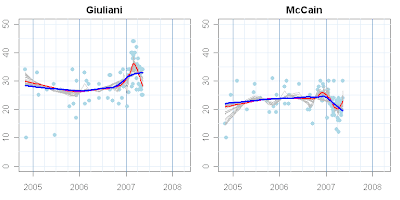 But the red trend for Giuliani has been quite consistent for some while. 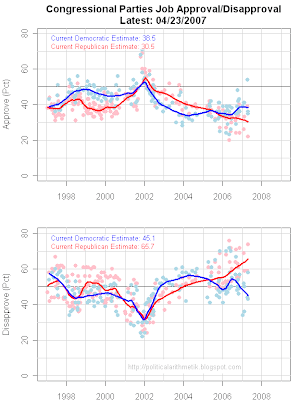 And the conservative Blue trend has been responding, if more slowly, by flattening out. So I think the issue is now whether Giuliani can reverse his recent decline. His attempt at clarification and candor on abortion in particular is a huge risk if the Republican base cannot accept those positions. Given Giuliani's clarified position, McCain appears to have started looking a bit better to Republican voters. And to credit McCain, perhaps his restarted campaign is now playing to more of his strengths than it did in December through February. The comparison of the two series is interesting. As the top figures shows, approval of Congress has generally been rising since the Democrats took control in January. The red line is the more sensitive trend estimate. It turns slightly down at the end, while the standard trend estimate continues to rise. The slight difference is not enough to convince me that there is any downturn at this point, despite the 5 point change in the AP poll over a month. As the graphic makes clear, there is lots of noise from poll to poll and the trend estimate is much more reliable than a poll to poll comparison. By contrast, the Presidential trend in the second figure has been quite flat since January, as both blue and red lines agree. 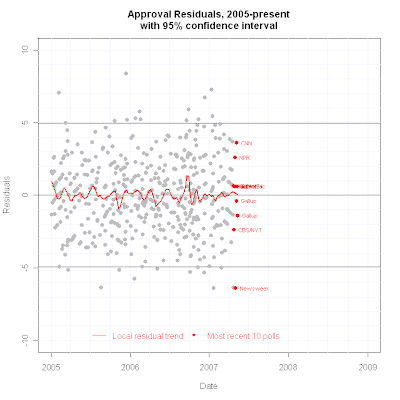 The level of approval of Congress was very low in late 2006 and remains well short of its high points in early 1998 and following 9/11 in 2002. (See the entire Congressional approval series since 1990 here.) But Congress is rarely loved. In the 17 years since 1990, Congressional approval has risen above 50% only twice-- rising just above 50% in early 1998 before dropping sharply after the impeachment of President Clinton late in 1998, and for a few months following 9/11. For the vast majority of the time since 1990, approval of Congress has been below 45% and below 40% for much of the time. In this light, while approvals of 35% apiece may be numerically equal, the political implications in light of historical polling are not the same. 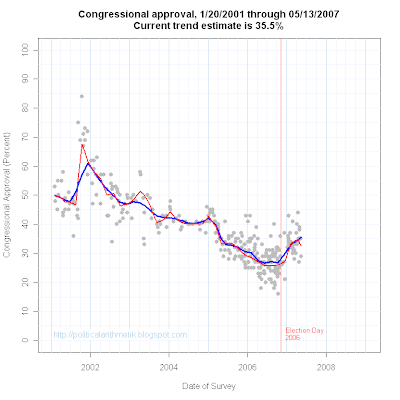 The most obvious difference is that in 2007 Congressional approval has been rising while that of the President has been stagnant. Democrats in Congress are not enjoying very high levels of approval, but they are doing considerably better than Republican members. (See the graph below.) While Democrats lead Republicans by 8 points on approval, Republican disapproval is a whopping 21 points higher than disapproval of the Democrats. There is a famous question in political science: "why do voters hate Congress but love their Congressman?" The simple answer is that the institution is a convenient whipping boy for the President but also for its own members. Many members (who often enjoy personal approval levels well above 50%) run for reelection by running against Congress as an institution. The result is approval ratings of the Congress that are poor in comparison to those of the President or of its individual members. Thus it becomes a dangerous thing to make direct comparisons of Presidential and Congressional approval. The two are quite different in their norms and dynamics. It would be better to look at Congressional approval in light of its own history, and the Republican victory in the 1994 elections and in government after 1995 provides an excellent point of comparison. Two new polls continue to reinforce the estimate of stable presidential approval. The AP/Ipsos poll, taken 5/7-9/07, finds approval at 35%, disapproval at 61%. 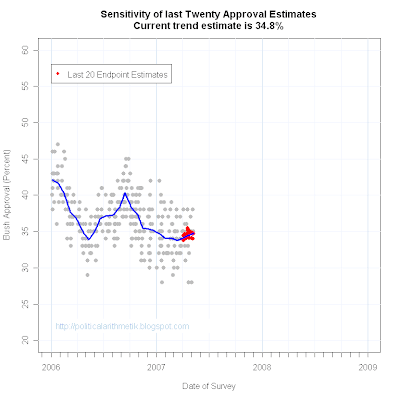 A new Gallup poll taken 5/10-13/07 has approval at 33%, disapproval at 62%. With these polls, my trend estimate is 34.4% approval. Approval has remained between 33% and 35% since January, with scattered polls above and below but little evidence of any enduring change from that range. The current polls do not raise any reevaluation of recent polling, so I'll just present the usual diagnostics below without further comment. See my previous posts in May on approval for a more extended discussion. 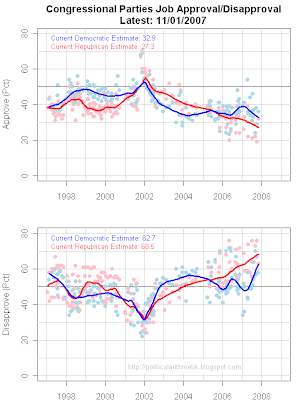 Approval of Republicans and Democrats in Congress trend. This post is updated in place. Come to this page for the latest tracking of the approval of congressional parties series. The index in the right column provides a direct link from the thumbnail to this page. ABC/WP: "Do you approve or disapprove of the way the Democrats/Republicans in Congress are doing their job?" Pew: "Do you approve or disapprove of the job the Democratic/Republican leaders in Congress are doing?" Harris: "How would you rate the job Democrats/Republicans in Congress are doing: excellent, pretty good, only fair, or poor?" A new AP/Ipsos poll taken 5/7-9/07 is out today with approval at 35% and disapproval at 61%. With this addition my approval trend estimate stands at 34.8%. There is not much to discuss here. The approval trend estimate has remained in the 33-35% range since January, and is still there. Once or twice we've bumped into those limits, only to promptly return to the range. At the moment we see a slight upward trend, but earlier this week saw a slight DOWNward trend. 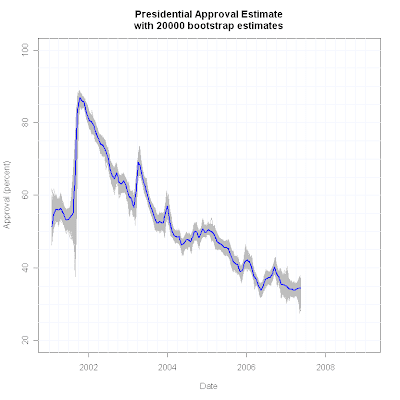 So I'd say the evidence so far gives no reason to think approval is doing anything other than remaining flat, with poll to poll variation bumping the trend up or down briefly. Everything looks pretty normal in the diagnostics below, so I'll not add any more commentary. See the earlier posts on approval this week for more analysis, all of which holds true in light of today's AP poll.